OK, I have had so many thoughts this past week about art I don’t even know where to begin. Maybe I should just serve you, the reader, with the salad of my thoughts, although I am not a fan of random collection of things and nobody likes a salad with random ingredients. I mean, really… cabbage may be OK in some pie, but it can totally ruin a salad, don’t you think? Nevertheless a salad it is, but I shall try to control the ingredients. So one thought I had is Why I want to paint to begin with (vs. some other form of art). What I like about painting vs. animation or a movie is that it captures one particular moment and by capturing a moment it can make the drama and significance of it more powerful than if it were part of a sequence of motion. I think a painting also has the power to capture motion is such a way that the painting seems to show the motion better than if it were a movie or an animation. Here is one example I stumbled upon recently, a painting by an artist named Carmen Mansilla. Choosing that particular moment inside the sequence of motion that best represents it can show the motion more clearly. Another reason I like painting, vs. sculpting, for example, is that a painting gives the artist the power to control the universe in which the character belongs, not just the character. Sculpting, however, sends a different message: that the figure is the only important thing. Its pose supersedes space and time, it is important by itself, regardless of its surrounding. Another thought I had is a better understanding of something I read in “The Romantic Manifesto” by Ayn Rand. Ayn Rand wrote about the key to evaluating art. If I may paraphrase (and I may, because I am the only one here to give myself permission), she says that art is as good or as bad as the degree of integration its execution has around its theme. Apologies to the reader for not being able to provide a direct quote, please search the book if you are interested where she discusses the idea in depth. What does this mean, then? It could take many forms. Harmony is a form of integration. Harmony of lines or of color. This is something I also learned from my teacher, Tenaya Sims: to see lines or “rhythms” in a painting of sculpture. In some cases, that is, in good art, those rhythms are not random, but they center around the painting’s theme (or main subject, or concept). I am not speaking here of the subject matter, but of the spiritual content that is communicated. (Please follow the link to see the sculpture). Bellow is that picture but I drew the lines of “rhythm” I saw in it. The “rhythm lines” here are variations on a theme. Each is different but they all have something in common. The lines of the folds, for example, all have the same degree of curvature and all converge into one point. The line of the fabric and the line of the stretched side of her body do the same. 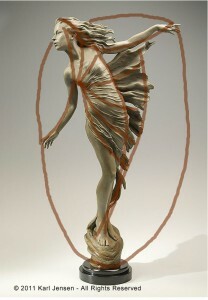 Now how do these lines serve to emphasize the sculpture’s theme? The concept is hard to put into words, but judging by her posture, I would analyze it in the following way: Her body is facing one way but her head and arms are starting to tilt sideways. She looks like her center of gravity is in that previous posture (of facing the viewer in this photo), but she wants to go out to that new place. Her arms create a separation between the bottom part that is facing “in the old direction” and the top part which is facing “in the new direction” and it looks as if her arms do something like half push down that previous “direction” and half lift up toward the “new direction”. The wind is blowing from the direction she is facing and wants to go to. 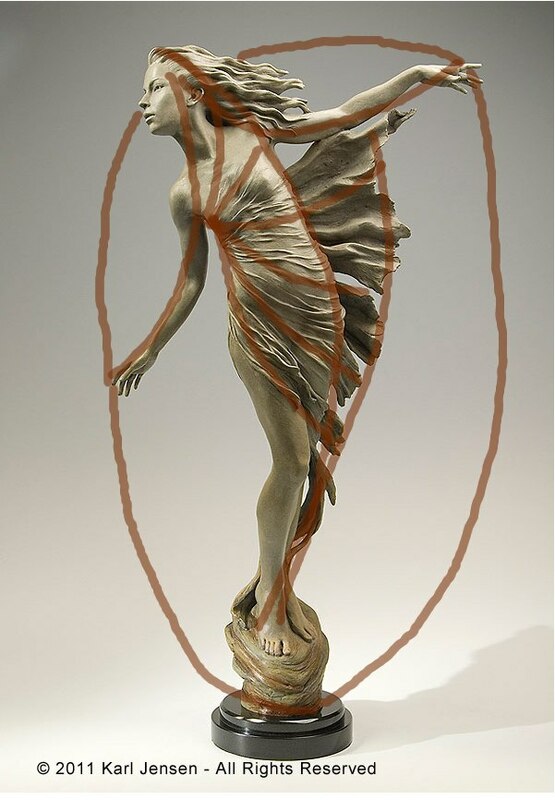 Her arms create a circle that puts the base of the sculpture in the center and leave the head coming out of that circle, which implies breaking through into something new. All the “rhythm lines” created by the fabric folds, her body tilt and her arms all point into the point of compression (her right waist). Now why is that point important? It’s because that is the turning point. If you try to follow the movement of the figure in the “next moments” when she turns out, the rotation of her body would revolve around that point of compression which is also, I believe, the center of gravity for a person holding this pose (this is why she holds her left arm outwards – to balance the weight). All in all the lines serve to emphasize the concept of the piece which is “Dare to Dream” – a turning point from that which exists and hold little interest to that which is new and exciting. OK, I think I’ll save the rest of my thoughts for next week, this analysis was quite draining. In fact, I don’t think I dare to display my own work in this same post after analyzing this sculpture. Don’t get me wrong, I value my paintings a lot, but sharing them here and now would hardly be a good way to celebrate the effort I put into them because I believe they would appear boring compared to the above (heck, they bore ME compared to the above and I’m the one who made them). Instead they should be judged in their proper context which is my education. They are exercises more than they are my art (although they have some of that, too).